So here's what I've been working on all day. A friend gave me this hanging shelf because she was just going to give it to the DI. So, I took it home and decided to try my hand at a little home decor that doesn't involve sewing. First, I cleaned it up with a wet rag. Second, I painted. I know that it's not exactly the best idea to paint straight over something like this, that you should sand it first, but because it is something that I'm not exactly attached to and because I wanted it to have an aged look anyway, I decided to skip the sanding and go straight to paint. Basically the only thing I know about painting is that you go with the grain of the wood. Not only did he provide the perfect solution to my problem, he did it for me... for free! What an awesome guy! All I had to pay for were the screws, sandpaper, and coat/hat hooks. What a guy! Fourth, I painted the new addition of board. 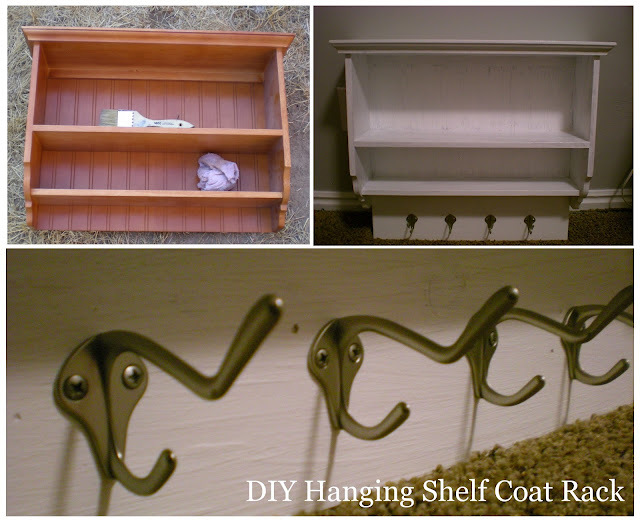 Fifth, I attached the coat/hat hooks, and that was it! So all in all, this project cost me $13.00. Thank you thrifting!